First-Friday tabling and bake sale! 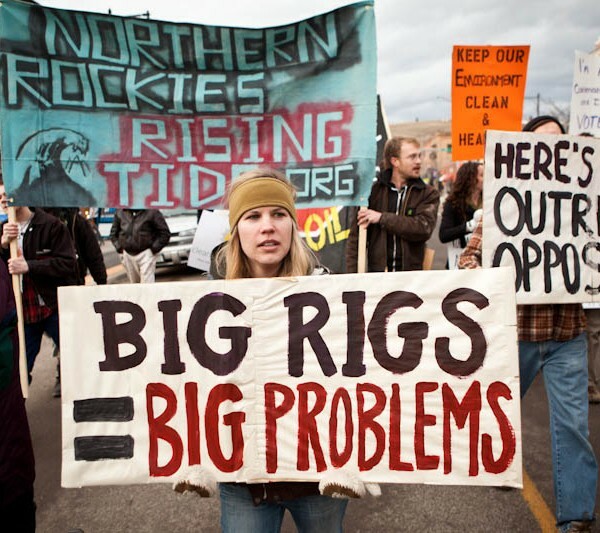 This Friday, April 1st, NRRT will be setting up on the NE corner of Main and Higgins in Downtown Missoula for Fossil Fool’s Day to discuss the big-rig campaign and enjoy some delicious food! We will have baked goods for sale, as well as up-to-date information on how you can get involved and what is next in the fight against climate change in the Northern Rockies. Set up will begin around 5pm and last until 8 or so. Bring your appetite! A really exciting piece of solidarity occurred in Portland five days ago but didn’t receive the attention it deserved. A group of Native American singers and activists gathered at the confluence of the Columbia and Willamette Rivers to protest oil companies shipping Tar Sands mining equipment over Highway 12. The full article can be found here. The bill introduced by Idaho republican Hartwood passed through the house a few days ago, but came under some hard scrutiny in the Senate. When questioned by Senator Elliot Werk (D-Boise) as to why he deemed the lawsuits “frivolous” when neither an Idaho judge nor the state hearing officer Hartwood replied, “I just used that term because sometimes that’s how I feel they are.” Hartwood’s bill follows the same tack taken by two other bills in the past regarding lawsuits over timber sales as well as nuclear shipments. both bills were passed in response to raising citizen concerns and attempts to oppose projects that were, in fact, hurting Idaho citizens. The two similar bills did pass, effectively limiting one legal avenue for public opposition. The kind of bill that Hartwood has proposed (in his belief to counter judges that may lean in favor of something that he does not like) are even to Hartwood suspect. “Certain judges do lean in different directions. A lot of times maybe their … personal opinion, and I know in my case often my own personal opinion overrides the right thing to do.” So far the motion to kill the bill failed, but a motion to amend the bill passed 6-3. Opposition to the megaloads built up steam along Highway 12 and in the Nez Perce reservation with a Heart of the Monster march. Residents marched to the actual Heart of the Monster site which lies right along the route the megalaods will travel. At about 2:30 am on Thursday morning, two residents of Missoula, MT, Carol Marsh, 69, and Ann Maechtlen, 50, sat down in the middle of Reserve St. in an attempt to halt the shipment of large, oversized loads of equipment heading to a ConocoPhillips tar sands oil refinery in Billings, MT. Marsh, a retired journalist and grandmother, and Maechtlen, a two-time cancer survivor, attempted three or four times to block the shipments but the police refused to arrest the two women, instead opting to forcefully remove them to the sidewalk as they were cheered on by a crowd of about 100 supporters. The police cited and released one other man who sat down with the two women. 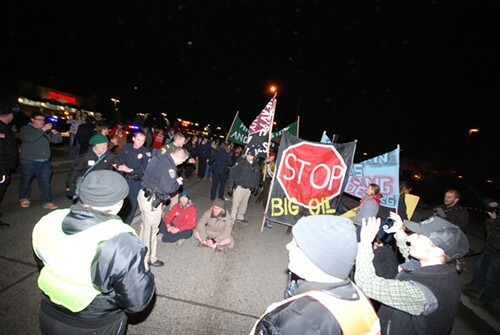 The action was the culmination of a “welcome to Missoula” street party organized by Northern Rockies Rising Tide (NRRT) in an effort to take back the streets from Big Oil. “These megaloads are serving refineries that process oil from the Alberta tar sands, the worst ecological disaster the planet has ever faced. The tar sands undermine any effort to stop global warming. I did this because I want there to be a world for my granddaughter to grow up in,” said Marsh. The NRRT action was preceded by two other demonstrations the same day, one of which drew about 70 people and ended in several arrests. As you already know, opponents of the megaload shipments are also concerned with the potentially devastating local impacts posed by the transformation of Montana’s scenic byways, specifically Hyw. 12, into an industrial shipping corridor for big oil corporations. “Conoco is merely the first in a potentially very long-line of oil companies. Exxon is next. The construction of a high-and-wide industrial shipping corridor through some of the most remote and scenic byways in our state represents an assault on Montana, and the strip-mining of tar sands represents an assault on Alberta and on the world. Make no mistake: we are going to stop this,” commented NRRT organizer Susie Rosett. This action was one of many steps in a continually escalating campaign. Let it be known: WE WON’T STOP UNTIL THEY DO. Both megaloads are now staged at an old weigh station just south of Missoula. The second load met the first early Wednesday morning after being stuck near Lolo Hot Springs the night before. There apparently was a bit of a hitch early in the morning as the load made it way through the intersection of Hwy 12 and Hwy93 as travelers were backed up for about two miles through Lolo. But according to the company this is no big deal. The loads were moved perfectly. We expect the two monsters to move down Reserve St. tonight beginning at midnight. Allies at All Against the Haul have planned a 5:30 march and vigil beginning at the X’s on Higgins this evening, as well as a midnight rally at the corner of South Ave. and Reserve St. to meet the loads as they pass. What’s gone wrong so far? Regardless of what you might be reading or seeing in the papers regarding the megaload move there have been many more problems than reported. We just received an update from the great folks who have been out on the road night after night for the last month documenting, videotaping, and generally watching the load travel the Idaho portion. Below you’ll find a list of many of the things that have gone wrong. -The first shipment took 6. -The second, 7 (once it reaches Lolo Pass from MP 169 tonight). –With layovers, the two, originally scheduled for 8 nights, have been enroute 34. What have the shipments done wrong? -traveled on snow covered pavement in snowstorms. -delayed traffic longer than 10 or 15 minutes multiple times during both shipments. -driven wheels outside the fog lines. -made extended loud noise with convoys of 20+ vehicles rolling by dozens of highway-side homes. -blinded and/or confused other drivers with the convoys’ glaring white lights and swirling yellow strobe lights. -disturbed people in dozens of highway-side homes into which those bright and swirling lights have shone. -used very confusing traffic management methods and yet chastised regular-traffic drivers for being confused. -commandeered the people’s highway by banning free-flowing regular traffic. -diverted traffic unto unpaved turnout surfaces. -used the people’s state police to intimidate and harass law-abiding people. -torn tree limbs throughout the corridor and hurriedly picked up, out of sight, the bigger limbs. -sprayed unknown amounts of deicing chemicals on the pavement, some of which runs off onto shoulders/riverbanks. beyond-normal wear and tear Idahoans will eventually pay to take care of. their salaries so that Idahoans will eventually pay officer retirees higher retirement dollars. -used the people’s ISP vehicles whose beyond-normal wear and tear Idahoans will eventually pay to take care of. -asked 7 commercial trucking companies to not use U.S.12 one night — yet still could not meet traffic delay time limits. When the Idaho Transportation Department followed each leg of each shipment with a press release that said, “traveled safely” and “without incident,” ITD was serving up pat statements in an attempt to publicly ignore or hide frequent violations of the requirements of the shipments. So, workers have been preparing Reserve St. in Missoula for the passage of the first two giant megaloads headed to Billings. The second load of the two will be moved to withing five miles of the Montana border tonight sometime after 10pm. It is assumed that sometime next week Exxon will send a test load through that same corridor that gave Cnnoco/Phillips trouble. Stop the Keystone XL Pipeline! 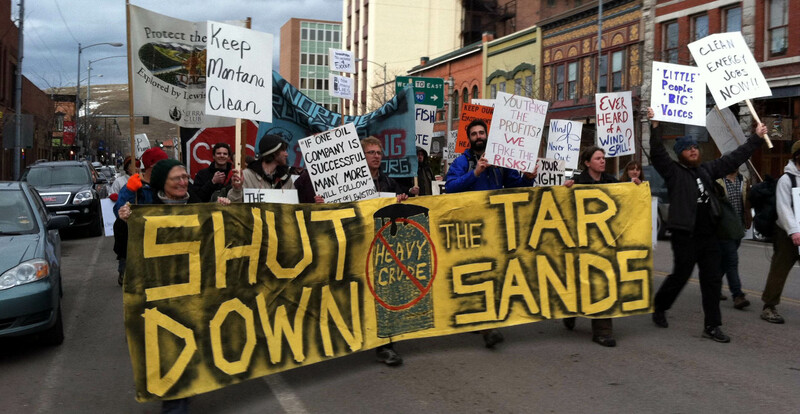 Petition to Oppose the Tar Sands Shipments!